Thought-provoking public art and effective placemaking knows no borders. Walk the streets of Downtown Jacksonville, and you’ll see yarn-bombs, murals and sculptures. Walk the streets of Brazil’s Sao Paulo, and you’ll likely run into the same. “[Crochet artist Leticia] Matos covers trees and street poles with woolen sleeves and small, colorful pompoms. Her works look like whimsical webs of rainbow yarn; the effect is surprising and oddly comforting. Read or listen to the full NPR story: In Gritty Sao Paulo, Artists Take To The Streets. In the comment section below, share your ideas for public art and placemaking in Downtown Jacksonville. Think it’s difficult to find parking in Downtown Jacksonville? Now that’s a myth worth busting. When I received a call for my first interview Downtown, I wasn’t worried about finding the building or the right office. Instead, my head was filled with horror stories from friends who constantly complained about the lack of parking. Needless to say, I left my house three hours early to ensure I would locate one of those “illusive” parking spots, but to my surprise, I found one a block from my destination. It turned out parking Downtown wasn’t so difficult after all. In a recent Downtown Marketing Collaborative survey, only 28 % of the respondents said parking was easy. As a new member of this statistic and a Jacksonville native, I was surprised that the percentage was so low. Downtown has more than 43,000 public parking spaces including lots, garages, metered street and peripheral parking. It’s important to remember that although you may not be able to park directly in front of your destination every time you visit, it’s nearly a guarantee that you can find spaces within a short walk just like Riverside, the Town Center or the Beaches. With this said, if you are still worried about finding a convenient spot, it always pays to plan ahead. Downtown Vision, Inc.’s website offers a database of parking information and FAQs. Also, the City is currently testing a new smartphone app, Parker that locates blocks with vacant parking spaces in real time. This free demonstration uses more than 100 Streetline sensors in metered spots along Laura Street as well as three crossing streets (Bay, Forsyth, and Adams) to help make your experience even easier. In addition to the plethora of spaces, parking in Downtown is inexpensive. Meters only cost 25 cents for every 30 minutes and are free on weekends, city holidays and after 6 p.m. Quarters, nickels and dimes are accepted by all meters and, in high-traffic areas, solar-powered meters accept credit cards as well as coins. Don’t let this parking myth prevent you from experiencing the urban core. Remember, there are more than 43,000 public parking spots and you only need one. From affixing a grill on the back of your bike, like the elegant “Backbrat,” to turning your beloved old ride into taxidermy (yes, seriously), bike culture is a passion for many. And why not? Biking is good for our health, our planet and our wallets. So then, why don’t we see more bikes in Downtown Jacksonville? To some extend, the fact that Jacksonville is so expansive plays a role. Most of us aren’t just going to hop on our beach cruisers and pedal over “the ditch” and all the way into Downtown. But more to the point, present day Downtown was not designed for bicycles. One-way streets were implemented in the 1960s with cars in mind, and more specifically to allow cars to travel faster in and out of Downtown – a product of their time but a detriment to cyclists. Mayor Brown celebrating last year’s Bike Month Downtown. In other words, as it relates to cyclists and pedestrians, the committee looks at transportation planning designs to make sure streets fit their physical settings and preserve scenic, aesthetic, historic and environmental resources, while maintaining safety and mobility. The goal is to create streets that don’t put the needs of cars over the needs of everyone else. At the heart of the issue is safety. Recently, the national Alliance for Biking and Walking ranked Jacksonville as the third-worst large city in the United States in average annual traffic deaths for bicyclists and the second worst for deaths of pedestrians, based on several factors including population. We can learn a lot from cities like Minneapolis, MN, where Downtown is filed with bike commuters and couriers. Bike shares, like these line the streets in Downtown Minneapolis. City buses and trains all have bicycle-carrying capabilities and office buildings are required by law to provide bicycle storage. A master bicycle plan intends to bring all residents within a half-mile of a bike lane by 2020. It’s no wonder Minneapolis was been ranked as one of the best biking city in the country by Bike Score, the #2 biking city by Bicycling Magazine, and the #4 bicycling city in the nation by the US Census Bureau. It’s this type of commitment to cycling that helps energize Downtown Minneapolis. So its great news then, that the Context Sensitive Streets Committee has drafted legislation to appoint a full-time bicycle/pedestrian coordinator to the Planning and Development Department. As the demand to live and work Downtown increases, we hope to see many more bikes Downtown and a shared understanding of sharing the road. Recently I spent a long weekend in NYC. It had been 12 years since I had visited the Big Apple, and I delighted in playing tourist: staying in mid-town Manhattan, attending a wedding in Long Island City and shopping in SoHo. But, despite the fact that I was visiting for pleasure, I couldn’t help but make mental notes of big city best practices. Learning curve aside, it’s easy to see how New York’s public transportation makes living without a car a reality for so many. You name it, I took it. Buses were standing room only. Buskers danced to Montell Jordan’s “This Is How We Do It” on the subway, while seasoned New Yorkers put on their best poker faces. (I couldn’t say which was more entertaining.) Taxis were convenient and warm on cold, snowy evenings. The waits were brief and the wayfinding concise. But in my opinion, the best part about public transit is the before and after… the walking, and its associated physical and mental health benefits that so many New Yorkers enjoy. New York’s public parks are well managed and programmed, drawing large crowds despite freezing March temperatures. Bryant Park is a frequently referenced case study for public space management and it’s easy to see why. Meticulously maintained, Bryant Park had lush landscaping, a wealth of moveable tables and chairs, hospitable signage, and plenty of programming: I happened upon both an ice-skating rink and a children’s health food festival during my stop. And though I only had a half hour to spend in Central Park, the experience there was quite similar. I watched harbor seals frolicking at the Central Park Zoo, spied a second ice-skating rink, and took in the natural beauty as I wandered among joggers, tourists and locals alike on a late Sunday afternoon. Adaptive reuse and historic preservation are alive and well in New York. Take trendy SoHo for example. Crowded streets zigzagged through the SoHo-Cast Iron Historic District. Decorative cast iron facades—dating back to between the 1840 to the 1880s in many cases—encompass pre-existing industrial buildings. The facades enabled buildings to attract commercial clients over the years. And then following the abandonment of a proposed elevated expressway plan, which would have devastated the area in the 1960s, the district attracted artists who utilized the buildings for living and working studios. Today, the district is listed on the National Register of Historic Places, declared a National Historic Landmark and is chocked full of galleries and shops. There’s something special about New York: the setting for so many stories, the subject of so many songs. And while there’s a lot to be learned from other cities big and small, I’m also reminded of all that’s special about Downtown Jacksonville. The small-town charm, locally owned and operated businesses, the way the Florida sun reflects off the St. Johns, and the vast possibilities for a city starting to come into its own. The Seamless City by Rick Baker, former Mayor of St. Petersburg is a primer on how to revitalize a city, and was based on Baker’s experience as Mayor from 2001-2010. The book details his plan of action, which included enhancing public safety, increasing jobs, improving government operations, addressing homelessness, promoting the city and measuring progress. In fact, it could be the playbook for almost any large urban area. Expand the number of reoccurring events along the waterfront park – with an emphasis on events that fill hotels. Develop and expand fixed activity generators like medical complexes, marine research, education, business, hotels, shopping and restaurants. Support and expand cultural amenities Downtown to become the cultural center of Florida. Make Beach Drive, along their waterfront park, a café and retail activity generator and link this district to other districts. Improve access to and around Downtown. Focus on making Downtown a more desirable place to live and work. Baker also referenced their failures along the way, which included attempts to recruit Full Sail University, the Savannah College of Art and Design and major retail Downtown. 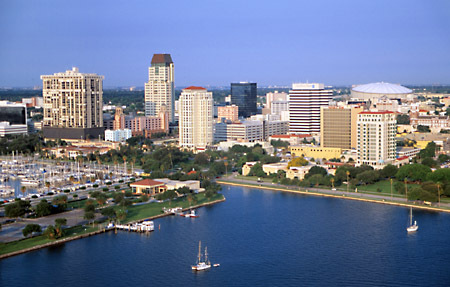 While each city is different, there are a few takeaways that Jacksonville can learn from. First, the Mayor and his administration to proactively pursued who and what they wanted Downtown. From recruiting businesses and schools to international art shows, the Mayor and the business community went after strategic sources to try and leverage their pull for Downtown. Second, while most cities talk about making their Downtowns a great place to live and work, St. Pete’s leadership knew this meant a careful attention to detail in making the Downtown more attractive. Wider sidewalks, café tables and umbrellas and flowers were implemented to create great public open spaces, which made people feel safe and comfortable while Downtown. Third, it takes a plan of three-to-five major initiatives, which are focused, executable in the short term and easily measurable. Mayor Baker will be in Jacksonville for the ULI North Florida Member-Only Breakfast Meeting on December 11th. The meeting is limited to the first 50 members to register. Our challenge in revitalizing Hemming Plaza is quite simply figuring out a way to bring more people to the Plaza. And one of the best practices for bringing more people to a public space is programming through free or low cost activities and vendors. On a large scale, consistent year-round programming often takes dedicated management. But on a small scale, sustainable, low-cost, low-risk activities can help create a trend, as DVI proved last Friday. The public space: Hemming Plaza, neighbor to City Hall, the Main Library and MOCA (Museum of Contemporary Arts), is known for its nuisance activity. The challenge: spend little-to-no money to bring people out of the surrounding office buildings for lunch. The solution: Picnic in the Plaza, a Friday lunchtime pop-up gathering of friends and coworkers, open to all. This grassroots gathering welcomed more than 100 people to the Plaza for lunch, including Mayor Brown and Councilman Brown. Based on the success, DVI’s staff has committed to continue the pop-up picnics each Friday, weather permitting for the foreseeable future. We hope you’ll join us. View photos from the first Picnic in the Plaza here. Please share your ideas for small ways to make a difference in our comment section.